Terrex is a new 8x8 wheeled armoured infantry fighting vehicle of the Singaporean Army. 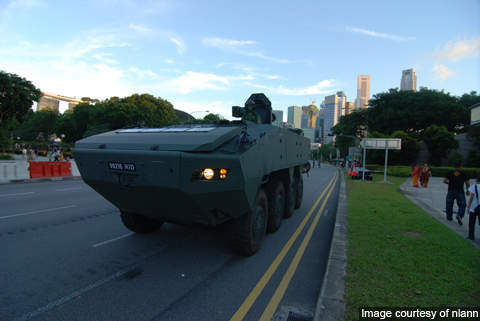 The Terrex 8x8 wheeled armoured vehicle at the National Day Parade 2010 combined rehearsal 2. Terrex AV-82 (Yavuz) is also licence-built by Otokar for the Turkish Armed Forces. 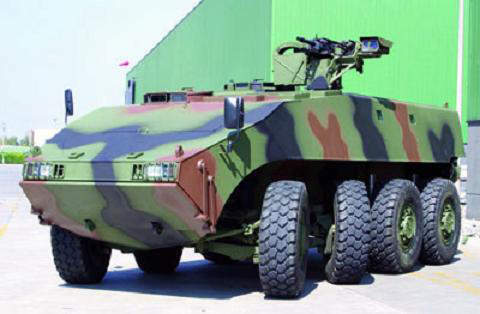 The Terrex AV-81 8×8 wheeled armoured vehicle / infantry carrier vehicle (ICV) was originally developed by Ireland-based Timoney for Singapore Technologies Kinetics. 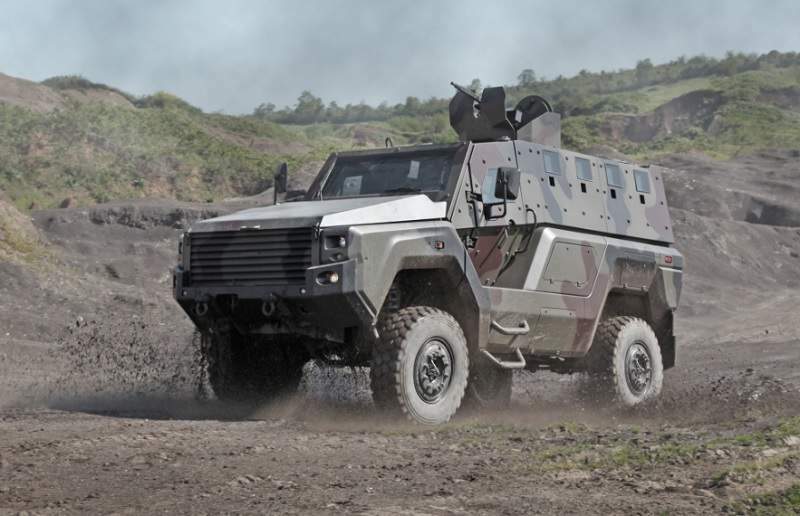 The vehicle is currently being produced by ST Kinetics in cooperation with the Singaporean Army and the Defence Science & Technology Agency (DSTA). Terrex provides troops with enhanced protection, mobility and optimum firepower in a single vehicle platform. A Turkish built variant called Yavuz (Terrex AV-82) was developed by Turkish automotive manufacturer Otokar for the Turkish Armed Forces. 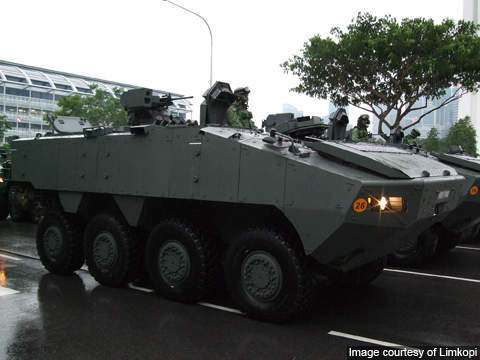 The Singaporean Army had fielded around 135 Terrex vehicles by 2010. Terrex is produced in five variants: trooper, command vehicle, engineer vehicle, ambulance and anti-tank guided missile (ATGM). The trooper offers spacious interiors to accommodate up to 13 crews (including driver) and combat payloads. The command vehicle is equipped with state-of-art data and communications systems for command and control role in the battlefield. The engineer vehicle is equipped with front push barrier for clearing obstacles and heavy short trackway bridge for bridge laying capability. The ambulance variant features lift support equipment for casualty evacuation during field operations. It is also provided with three stretcher loading systems (SLSs) for fast loading / unloading of laid casualties. The ATGM vehicle is mounted with Spike ATGM system. "Terrex provides troops with enhanced protection, mobility and optimum firepower." Terrex is fitted with a twin-weapon remote control weapon system (RCWS). It is also armed with a 40mm automatic grenade launcher and a 7.62mm general purpose machine gun. Terrex is the first in the world to feature this unique combination. A 12.7mm heavy machine gun and up to two rear general-purpose machine guns will be mounted in another configuration. The RCWS is provided with an optical or thermal sight that can be used by the vehicle and troop commanders for surveillance, target examination and target damage assessment. The performance of RCWS has been improved with the man-machine interface (MMI) through human factors engineering. Custom-built target engagement screen and built-in test (BIT) features are also offered to users. The improved MMI and BIT characteristics significantly optimise the usage of RCWS. The cameras mounted all around the vehicle form closed hatch driving system (CHDS) and all-round surveillance system (ARSS). This allows troops to operate Terrex safely from within the vehicle. The three LCD screens located in the driver compartment allow the driver to select camera views in both day and night conditions. The onboard closed hatch driving and surveillance system is the first of its kind to use a network of cameras. The CHDS and ARSS provide greater protection for troops, especially when operating in urban environments. The vehicle’s position is reflected on the raster / aerial photo maps and signals displayed at the driving station. These features provide independence to the driver for navigation rather than depending on the vehicle commander for directions. The vehicle is equipped with an improved weapon detection system (WDS). The WDS is an acoustic system which detects shots that are fired at and around the vehicle from the enemy forces. It masks shots fired from the vehicle, hence these shots are not displayed on the battlefield management system (BMS). This will eliminate the possibility of confusion between own and enemy fires. "Terrex is produced in five variants." The BMS, WDS and RCWS are integrated to create a closed loop sensor-shooter system that detects sites and turns the RCWS towards enemy fire. This enables Terrex to respond rapidly to enemy fire. Terrex can be fitted with passive or active armour suites offering all-round protection against threats from improvised explosive devices (IED). The vehicle offers excellent mine blast protection. It can also be installed with nuclear, biological and chemical (NBC) protection systems. Terrex is powered by a Caterpillar C9 turbocharged diesel engine mounted forward of the hull. The engine coupled to Allison 4500SP wide ratio automatic transmission develops 336kW power. Terrex is equipped with an independent suspension system which provides ground mobility and ride comfort over even the roughest terrain. The built-in central tyre inflation system (CTIS) allows automated inflation and deflation of tyres for different terrains during the movement. The large footprint off-road tyres enables the vehicle to cross soft ground with ease. The digital vehicle interface module (DVIM) at the driver station displays pitch and roll signals when the vehicle runs on slopes. It also warns the driver if the vehicle reaches its overturning limit for up, down and side gradients. These alerts enhance the safety of the troops within the vehicle by preventing overturning. Otokar supplies modern armies with innovative tactical vehicle configurations from its product range, covering the entire selection of armoured vehicles including 4x4 to 8x8 wheeled and tracked vehicles, and main battle tanks from 4t to 60t. 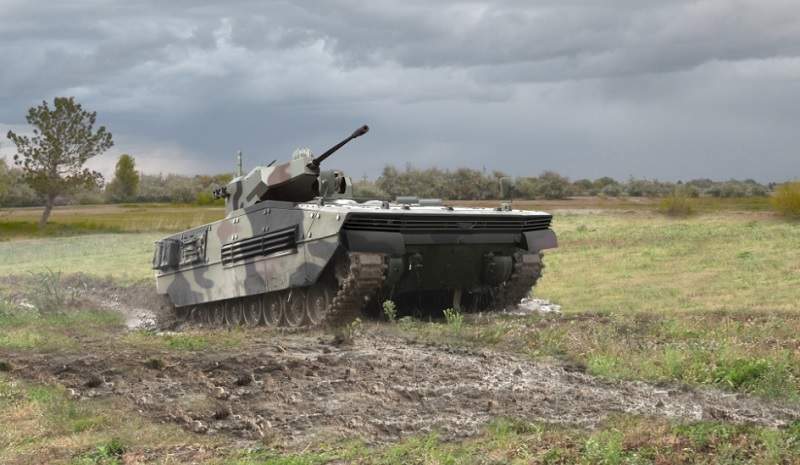 TULPAR is designed as a multi-purpose vehicle platform with its significant ballistic and mine protection and superior firepower to support new-generation main battle tanks in battlefield and also for providing fire support for infantry. KAYA II has been specially designed and developed as a Mine-Resistant Personnel Carrier to provide high protection against mine and ballistic threats in addition to its superior mobility.